A Reader Writes "...I'm trying to figure out where to look....."
After writing about the terrible market conditions that we have been experiencing, especially the last week or two, it is nice for a change to answer a question from a new investor, a reader who also happened to visit my stock club this past month. Mike A. is trying to figure out how I go about 'picking' stocks and where he can find the information both about my process as well as the actual data underlying my decisions. (increasing positive free cash flow, increasing dividend). Thanks so much Mike! As you may know, I have been in and out of shares of Graham (GHM) several times now. I am currently a shareholder, but with the volatility of the market, that could well change! Let me try to briefly answer your questions. There are just a few places that I tend to go to get the information you are asking about. I shall give you the links which will be 'hyperlinked' so you just need to 'click' on the words which should be in blue or purple to get you to these pages for the information. Let me review again with you (and the rest of the readers) some of the key things that go into my selection of a stock for inclusion in this blog and possible inclusion into my own trading account. First of all, I start looking for stocks on the top % gainers lists. I generally stay with stocks near $10 or higher so as to avoid getting stuck with the inherent volatility (in these volatile times) of lower priced stocks. (As I got stock with Servotronics (SVT)). Working with Yahoo, I enter the symbol for Graham which is the three letters GHM into the box for the "get quotes". That will get you here. To find the latest quarter, I go to the "Headlines" link along the left side of the page which is below the section head of "News & Info". Clicking on that gets you here. Scrolling down the list of headlines, you can see the headline titled on "Fri, Aug 1, 2008" "Graham Corporation Reports Net Income More Than Doubles on 38% Increase in Sales for First Quarter Fiscal 20009"....a Business Wire story which is found here. It certainly was a strong report from my perspective. You can peruse it further to see if there is anything in that story that should have drawn my attention. Going back to your question. I then look for data. Most of the data can come from my longer-term view which I find on Morningstar.com. If you click on the "Direct to Morningstar.com" or simply wait, it will open up a page that looks like you need to register. You don't. Up towards the upper left on the page under the Morningstar logo, is an empty field where you can enter symbols for "Quotes". Enter GHM there and you will get to this page. (You can close the annoying pop-up for the Economist Magazine). Now head over to the "Financial Statements" section by clicking on those words along the left side of the page in the box of terms headed up by "Snapshot". If you click on "Financial Statements" it should get you here. 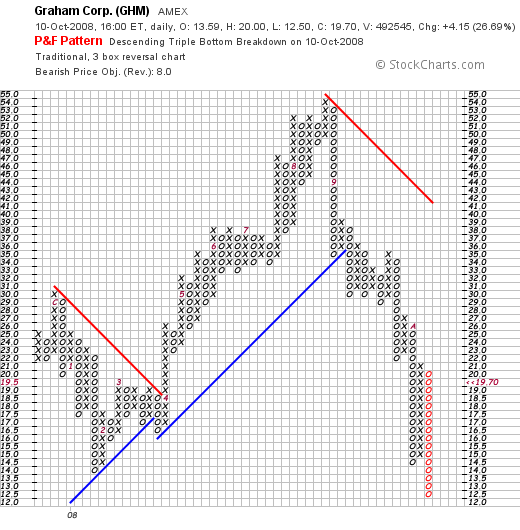 You should be looking at the "10-Yr Income" for Graham (GHM). I find the "5-Yr Restated" the easiest to utilize....at least for me. You can find that page by looking at the tabs above the blue bargraphs with the yellow background titled "5-Yr Restated". If you click on that page, it should get you here. This page is really helpful imho. Here we can get the data that really provides me with the bulk of my analysis: the revenue growth, earnings growth, dividends--which I don't require but like and if they do pay dividends, I like it even more, like you say, if they raise them on some regular basis--outstanding shares....which here have been 4 million 2004 to 2005, and 5 million since then---relatively stable. I also look at free cash flow, which for Graham is positive and growing, and the balance sheet, checking the cash and current assets relative to the current liabilities and then inspecting the long-term liabilities. Graham checks out just fine in this regard. Returning back to the Yahoo Finance Page for Graham, I usually like to loook at the Yahoo "Key Statistics" which is found along the left side under the section in bold called "Company". For Graham (GHM), it is located here. On that page, I can get some basic 'value numbers' like the Market Cap, the p/e ratio, the PEG ratio, the Price/Sales ratio (which I like to compare to other companies utilizing my Fidelity.com page, the outstanding shares, the short interest----indicating the number of shares out short relative to the daily trading volume, and the latest stock split and yield. If you look at a few of my past write ups of stocks, you can follow along as I link to this information and discuss it over and over again. Finally, I like to look at a chart. Mike I hope that answers your questions about finding information on stocks. If you talk to some other investors, I am sure you will find and identify other sources of similar information. This is just what I like to do. Many people like to look at other pieces of information that are probably equally important including insider buying and selling and other technical charts. Explore some of these other approaches as well, utilize anything I do to your own advantage, and with time you will easily pass my own simple grasp of stocks without too much effort or time on your own part! Thanks for inquiring. Let me know if you would like me to discuss my portfolio management strategies or my general and idiosyncratic rules for buying and selling portions of stocks at varying price levels. LDK Solar (LDK), Servotronics (SVT), and Potash (POT) "Trading Transparency"
Hello Friends! Thanks so much for stopping by and visiting my blog, Stock Picks Bob's Advice! As always, please remember that I am an amateur investor (! ), so please remember to consult with your professional investment advisers prior to making any investment decisions based on information on this website. Getting away from the market and the workplace, I had a nice dinner last night at Hackberry's in La Crosse. If you are driving through this town, stop by and visit our Co-Op and get a bite 'upstairs' at the restaurant. You probably aren't wondering, but I had the 'Brown Rice Sir Fry' with the chicken added on top :). For $10.75, it was more than enough for dinner! I like this restaurant because it is relatively easy to walk right in and eat, has reasonable prices and good food, and a view of the downtown. Getting back to work today, I checked the portfolio realizing that some of my stocks (as I wrote last night) had likely hit sale points. Indeed, I was starting to feel a bit 'banged-up' by this vicious correction! First of all my LDK Solar shares were acting less than sunny, and in fact were trading below my (8)% loss limit. I sold my 280 shares of LDK at $20.43, having just purchased these shares YESTERDAY at $23.82 (!) ----OUCH----for a loss of $(3.39) or (14.2)% in about 24 hours! But the disaster that was the stock market didn't stop there! Servotronics. Another purchase from YESTERDAY of 700 shares at $8.45/share; these shares were unloaded this morning at $7.05. This was a QUICK loss of $(1.40) or (16.6)% in about 24 hours. YIKES AGAIN! But wait, the disaster wasn't complete! Potash Corporation (POT), that I have been ribbing my good friend Jerry H. who I walk with in the morning about HIS problems with this stock, well, I couldn't help myself and get in there and bloody my own nose on this stock. In fact, I haven't even had the time or made the time to write this stock up after purchasing 70 shares 10/8/08 (two days ago!) at a price of $95.84. Potash (POT) dipped quickly and my shares were sold at $84.67 for a loss of $(11.17) or (11.7)% since my purchase. The market is crazy enough that the stock flew back later in the day to close at $91.08, down only $(1.77) or (1.91)% on the day. Too late for me as I was no longer a share-holder. Not all was lost as my recent purchase of Graham (GHM), a stock that I thought I might be also selling today, closed at $19.70, up $4.15 or 26.695 on the day. I had purchased my 420 shares of GHM two days ago as well at $16.33. Thus, I now have a gain (for the moment) of $3.37 or 20.6% since that purchase. Now down to two positions (Graham (GHM) and Covance (CVD)), I do not think I shall be that quick to spend that nickel in my pocket and get back to my alotted 5 positions. Of course.....you know I never do have much self control so if there is some large move on the upside....well you know I shall be checking out those top % gainers lists no matter what I tell you this evening! Thanks again for visiting! This kind of market only brings to mind one image for me. 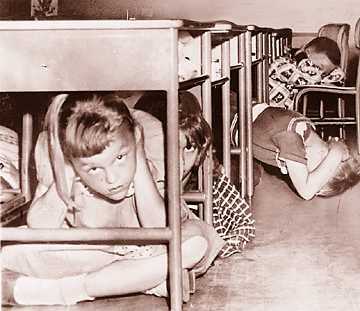 My desire to climb under my desk as all hell breaks loose as I did so many years ago during the 'cold war' when we all needed to be ready for a 'drop drill' on a moment's notice! I guess that kind of comment is rather revealing of my age! I hope you all have a nice weekend and that next week finds us in a market that is acting a bit more sensibly than what we have experienced this past week of trading! Is This Time Going to Be Like 1929? How do you describe the trading action on Wall Street? A "correction"? A "Bear Market"? Or is it more like a slow-motion crash. A crash that isn't really that slow at all! The difference thus far is the degree of the fall. 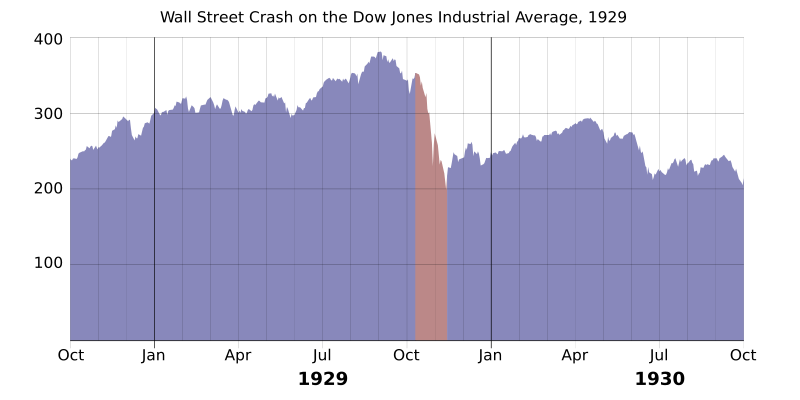 By the end of the crash in 1932, stocks has declined by 91% from their peak. There are some spooky parallels between 1929 and today. "Following the Wall Street Crash, the U.S. economy had gone into a depression, and a large number of banks failed. The Pecora Commission initiated major reform of the American financial system. As Chief Counsel, Ferdinand Pecora personally examined many high-profile witnesses that included some of the nation's most influential bankers and stockbrokers. As the Commission's first witness, Richard Whitney, president of the New York Stock Exchange, declared that "The Exchange's refusal to pay heed to popular demand for reform was simply a manifestation of courage to do those things which are right, regardless of how unpopular they may be for the time being." Other important members of the Wall Street financial community to give testimony before the Commission included investment bankers Otto H. Kahn, Charles E. Mitchell, Thomas W. Lamont, and Albert H. Wiggin, plus celebrated commodity market speculators such as Arthur W. Cutten. Given wide media coverage, the testimony of the powerful banker J.P. Morgan, Jr. caused a public outcry after he admitted under examination that he and many of his partners had not paid any income taxes in 1931 and 1932. As reiterated by SEC Chairman Arthur Levitt during his 1995 testimony before the United States House of Representatives, the Pecora Commission uncovered a wide range of abusive practices on the part of banks and bank affiliates. These included a variety of conflicts of interest such as the underwriting of unsound securities in order to pay off bad bank loans as well as "pool operations" to support the price of bank stocks. The hearings galvanized broad public support for new securities laws. As a result of the Pecora Commission's findings, the United States Congress passed the Securities Act of 1933 and the Securities Exchange Act of 1934, instituting disclosure laws for corporations seeking public financing, and in 1935 formed the SEC as a means to enforce the new Acts." "Following the Great Crash of 1929, one of every five banks in America fails. Many people, especially politicians, see market speculation engaged in by banks during the 1920s as a cause of the crash. In 1933, Senator Carter Glass (D-Va.) and Congressman Henry Steagall (D-Ala.) introduce the historic legislation that bears their name, seeking to limit the conflicts of interest created when commercial banks are permitted to underwrite stocks or bonds. In the early part of the century, individual investors were seriously hurt by banks whose overriding interest was promoting stocks of interest and benefit to the banks, rather than to individual investors. The new law bans commercial banks from underwriting securities, forcing banks to choose between being a simple lender or an underwriter (brokerage). The act also establishes the Federal Deposit Insurance Corporation (FDIC), insuring bank deposits, and strengthens the Federal Reserve's control over credit. The Glass-Steagall Act passes after Ferdinand Pecora, a politically ambitious former New York City prosecutor, drums up popular support for stronger regulation by hauling bank officials in front of the Senate Banking and Currency Committee to answer for their role in the stock-market crash. In 1956, the Bank Holding Company Act is passed, extending the restrictions on banks, including that bank holding companies owning two or more banks cannot engage in non-banking activity and cannot buy banks in another state." Beginning in the 1960s, banks lobby Congress to allow them to enter the municipal bond market, and a lobbying subculture springs up around Glass-Steagall. Some lobbyists even brag about how the bill put their kids through college. In the 1970s, some brokerage firms begin encroaching on banking territory by offering money-market accounts that pay interest, allow check-writing, and offer credit or debit cards. In December 1986, the Federal Reserve Board, which has regulatory jurisdiction over banking, reinterprets Section 20 of the Glass-Steagall Act, which bars commercial banks from being "engaged principally" in securities business, deciding that banks can have up to 5 percent of gross revenues from investment banking business. The Fed Board then permits Bankers Trust, a commercial bank, to engage in certain commercial paper (unsecured, short-term credit) transactions. In the Bankers Trust decision, the Board concludes that the phrase "engaged principally" in Section 20 allows banks to do a small amount of underwriting, so long as it does not become a large portion of revenue. This is the first time the Fed reinterprets Section 20 to allow some previously prohibited activities. In the spring of 1987, the Federal Reserve Board votes 3-2 in favor of easing regulations under Glass-Steagall Act, overriding the opposition of Chairman Paul Volcker. The vote comes after the Fed Board hears proposals from Citicorp, J.P. Morgan and Bankers Trust advocating the loosening of Glass-Steagall restrictions to allow banks to handle several underwriting businesses, including commercial paper, municipal revenue bonds, and mortgage-backed securities. Thomas Theobald, then vice chairman of Citicorp, argues that three "outside checks" on corporate misbehavior had emerged since 1933: "a very effective" SEC; knowledgeable investors, and "very sophisticated" rating agencies. Volcker is unconvinced, and expresses his fear that lenders will recklessly lower loan standards in pursuit of lucrative securities offerings and market bad loans to the public. For many critics, it boiled down to the issue of two different cultures - a culture of risk which was the securities business, and a culture of protection of deposits which was the culture of banking. In March 1987, the Fed approves an application by Chase Manhattan to engage in underwriting commercial paper, applying the same reasoning as in the 1986 Bankers Trust decision, and in April it issues an order outlining its rationale. While the Board remains sensitive to concerns about mixing commercial banking and underwriting, it states its belief that the original Congressional intent of "principally engaged" allowed for some securities activities. The Fed also indicates that it will raise the limit from 5 percent to 10 percent of gross revenues at some point in the future. The Board believes the new reading of Section 20 will increase competition and lead to greater convenience and increased efficiency. In August 1987, Alan Greenspan -- formerly a director of J.P. Morgan and a proponent of banking deregulation -- becomes chairman of the Federal Reserve Board. One reason Greenspan favors greater deregulation is to help U.S. banks compete with big foreign institutions. In January 1989, the Fed Board approves an application by J.P. Morgan, Chase Manhattan, Bankers Trust, and Citicorp to expand the Glass-Steagall loophole to include dealing in debt and equity securities in addition to municipal securities and commercial paper. This marks a large expansion of the activities considered permissible under Section 20, because the revenue limit for underwriting business is still at 5 percent. Later in 1989, the Board issues an order raising the limit to 10 percent of revenues, referring to the April 1987 order for its rationale. In 1990, J.P. Morgan becomes the first bank to receive permission from the Federal Reserve to underwrite securities, so long as its underwriting business does not exceed the 10 percent limit. In 1984 and 1988, the Senate passes bills that would lift major restrictions under Glass-Steagall, but in each case the House blocks passage. In 1991, the Bush administration puts forward a repeal proposal, winning support of both the House and Senate Banking Committees, but the House again defeats the bill in a full vote. And in 1995, the House and Senate Banking Committees approve separate versions of legislation to get rid of Glass-Steagall, but conference negotiations on a compromise fall apart. 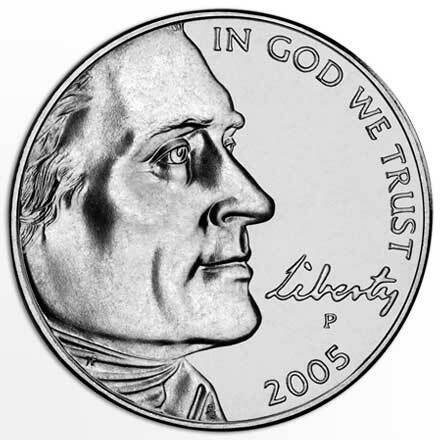 Attempts to repeal Glass-Steagall typically pit insurance companies, securities firms, and large and small banks against one another, as factions of these industries engage in turf wars in Congress over their competing interests and over whether the Federal Reserve or the Treasury Department and the Comptroller of the Currency should be the primary banking regulator. In December 1996, with the support of Chairman Alan Greenspan, the Federal Reserve Board issues a precedent-shattering decision permitting bank holding companies to own investment bank affiliates with up to 25 percent of their business in securities underwriting (up from 10 percent). This expansion of the loophole created by the Fed's 1987 reinterpretation of Section 20 of Glass-Steagall effectively renders Glass-Steagall obsolete. Virtually any bank holding company wanting to engage in securities business would be able to stay under the 25 percent limit on revenue. However, the law remains on the books, and along with the Bank Holding Company Act, does impose other restrictions on banks, such as prohibiting them from owning insurance-underwriting companies. In August 1997, the Fed eliminates many restrictions imposed on "Section 20 subsidiaries" by the 1987 and 1989 orders. The Board states that the risks of underwriting had proven to be "manageable," and says banks would have the right to acquire securities firms outright. In 1997, Bankers Trust (now owned by Deutsche Bank) buys the investment bank Alex. Brown & Co., becoming the first U.S. bank to acquire a securities firm. At a dinner in Washington in February 1998, Sandy Weill of Travelers invites Citicorp's John Reed to his hotel room at the Park Hyatt and proposes a merger. In March, Weill and Reed meet again, and at the end of two days of talks, Reed tells Weill, "Let's do it, partner!" On April 6, 1998, Weill and Reed announce a $70 billion stock swap merging Travelers (which owned the investment house Salomon Smith Barney) and Citicorp (the parent of Citibank), to create Citigroup Inc., the world's largest financial services company, in what was the biggest corporate merger in history. The transaction would have to work around regulations in the Glass-Steagall and Bank Holding Company acts governing the industry, which were implemented precisely to prevent this type of company: a combination of insurance underwriting, securities underwriting, and commecial banking. The merger effectively gives regulators and lawmakers three options: end these restrictions, scuttle the deal, or force the merged company to cut back on its consumer offerings by divesting any business that fails to comply with the law. Weill meets with Alan Greenspan and other Federal Reserve officials before the announcement to sound them out on the merger, and later tells the Washington Post that Greenspan had indicated a "positive response." In their proposal, Weill and Reed are careful to structure the merger so that it conforms to the precedents set by the Fed in its interpretations of Glass-Steagall and the Bank Holding Company Act. Unless Congress changed the laws and relaxed the restrictions, Citigroup would have two years to divest itself of the Travelers insurance business (with the possibility of three one-year extensions granted by the Fed) and any other part of the business that did not conform with the regulations. Citigroup is prepared to make that promise on the assumption that Congress would finally change the law -- something it had been trying to do for 20 years -- before the company would have to divest itself of anything. Citicorp and Travelers quietly lobby banking regulators and government officials for their support. In late March and early April, Weill makes three heads-up calls to Washington: to Fed Chairman Greenspan, Treasury Secretary Robert Rubin, and President Clinton. On April 5, the day before the announcement, Weill and Reed make a ceremonial call on Clinton to brief him on the upcoming announcement. The Fed gives its approval to the Citicorp-Travelers merger on Sept. 23. The Fed's press release indicates that "the Board's approval is subject to the conditions that Travelers and the combined organization, Citigroup, Inc., take all actions necessary to conform the activities and investments of Travelers and all its subsidiaries to the requirements of the Bank Holding Company Act in a manner acceptable to the Board, including divestiture as necessary, within two years of consummation of the proposal. ... The Board's approval also is subject to the condition that Travelers and Citigroup conform the activities of its companies to the requirements of the Glass-Steagall Act." Following the merger announcement on April 6, 1998, Weill immediately plunges into a public-relations and lobbying campaign for the repeal of Glass-Steagall and passage of new financial services legislation (what becomes the Financial Services Modernization Act of 1999). One week before the Citibank-Travelers deal was announced, Congress had shelved its latest effort to repeal Glass-Steagall. Weill cranks up a new effort to revive bill. Weill and Reed have to act quickly for both business and political reasons. Fears that the necessary regulatory changes would not happen in time had caused the share prices of both companies to fall. The House Republican leadership indicates that it wants to enact the measure in the current session of Congress. While the Clinton administration generally supported Glass-Steagall "modernization," but there are concerns that mid-term elections in the fall could bring in Democrats less sympathetic to changing the laws. In May 1998, the House passes legislation by a vote of 214 to 213 that allows for the merging of banks, securities firms, and insurance companies into huge financial conglomerates. And in September, the Senate Banking Committee votes 16-2 to approve a compromise bank overhaul bill. Despite this new momentum, Congress is yet again unable to pass final legislation before the end of its session. As the push for new legislation heats up, lobbyists quip that raising the issue of financial modernization really signals the start of a fresh round of political fund-raising. Indeed, in the 1997-98 election cycle, the finance, insurance, and real estate industries (known as the FIRE sector), spends more than $200 million on lobbying and makes more than $150 million in political donations. Campaign contributions are targeted to members of Congressional banking committees and other committees with direct jurisdiction over financial services legislation. After 12 attempts in 25 years, Congress finally repeals Glass-Steagall, rewarding financial companies for more than 20 years and $300 million worth of lobbying efforts. Supporters hail the change as the long-overdue demise of a Depression-era relic. On Oct. 21, with the House-Senate conference committee deadlocked after marathon negotiations, the main sticking point is partisan bickering over the bill's effect on the Community Reinvestment Act, which sets rules for lending to poor communities. Sandy Weill calls President Clinton in the evening to try to break the deadlock after Senator Phil Gramm, chairman of the Banking Committee, warned Citigroup lobbyist Roger Levy that Weill has to get White House moving on the bill or he would shut down the House-Senate conference. Serious negotiations resume, and a deal is announced at 2:45 a.m. on Oct. 22. Whether Weill made any difference in precipitating a deal is unclear. On Oct. 22, Weill and John Reed issue a statement congratulating Congress and President Clinton, including 19 administration officials and lawmakers by name. The House and Senate approve a final version of the bill on Nov. 4, and Clinton signs it into law later that month. Just days after the administration (including the Treasury Department) agrees to support the repeal, Treasury Secretary Robert Rubin, the former co-chairman of a major Wall Street investment bank, Goldman Sachs, raises eyebrows by accepting a top job at Citigroup as Weill's chief lieutenant. The previous year, Weill had called Secretary Rubin to give him advance notice of the upcoming merger announcement. When Weill told Rubin he had some important news, the secretary reportedly quipped, "You're buying the government?" And what of the current crisis? "Radical steps by the Fed under chairman Ben Bernanke — all in the name of seeking to halt the panic sweeping financial markets — are turning it into a financial colossus. They're also putting the government deeper in debt and taxpayers further at risk if the various moves fail. And it's being done with little direct interaction with Capitol Hill. The Fed does not depend on Congress for its budget, including its payroll, and is as much a creature of the nation's banking system as part of the federal government. On Tuesday, the Fed announced it will buy vast amounts of corporate debt, some of it unsecured, in hopes of renewing the flow of money in so-called commercial paper markets. That is where many companies turn for short-term loans to finance their most basic day-to-day operations, such as purchasing supplies or making payrolls. That action came just a day after the Fed increased a short-term loan program to as much as $900 billion by the end of the year — exceeding even the government's $700 billion bailout plan enacted on Friday. "Almost every day there's a new program. It's almost Rooseveltian, if that's a word," said David Jones, chief economist at DMJ Advisors in Denver and a longtime Fed watcher. He was referring to bold federal programs undertaken by President Franklin D. Roosevelt in the 1930s to battle the Great Depression. "Certainly, the Fed is pressing against the bounds of its territory as the central bank. But we got into the Depression precisely because the Fed then stood by and watched most of the banking system fail, watched the money supply contract by a third, and did nothing about it. You cannot criticize this Fed for trying to do something about a crisis which has basically shut the flow of credit down to a trickle and poses a threat to the economy," Jones said. Wall Street was not yet impressed. 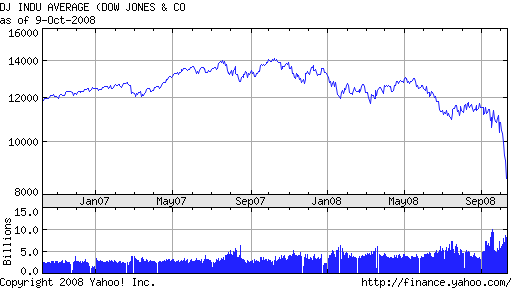 The Dow Jones industrials sank an additional 508 points. The Bernanke Fed first invoked rarely used 1930s powers to intervene — with taxpayer backing — in March when it provided a $29 billion loan as part of JPMorgan Chase & Co.'s takeover of Bear Stearns. Since then, it has launched programs to extend loans to nonbank financial companies, to provide backstop insurance for money-market mutual funds and a $85 billion taxpayer-backed loan to bail out American International Group, one of the world's largest insurers. Bernanke on Tuesday defended the Fed's steps, along with the huge separate bailout program to allow the government to take over hard-to-sell mortgage-related securities now clogging bank balance sheets." Once again is about bank balance sheets. About securities and derivatives of questionable value threatening the viability of our banking system. It has taken us 75 years to destroy Glass-Steagall, and in days we are seeing our financial systems now self-destruct as they are overwhelmed with CMO's, CDS's, and an Alphabet-soup of paper of questionable value. 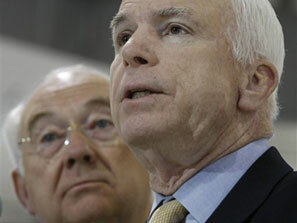 "The general co-chairman of John McCain’s presidential campaign, former Sen. Phil Gramm (R-Texas), led the charge in 1999 to repeal a Depression-era banking regulation law that Democrat Barack Obama claimed on Thursday contributed significantly to today’s economic turmoil. Gramm’s role in the swift and dramatic recent restructuring of the nation’s investment houses and practices didn’t stop there. A year after the Gramm-Leach-Bliley Act repealed the old regulations, Swiss Bank UBS gobbled up brokerage house Paine Weber. Two years later, Gramm settled in as a vice chairman of UBS’s new investment banking arm. Later, he became a major player in its government affairs operation. According to federal lobbying disclosure records, Gramm lobbied Congress, the Federal Reserve and the Treasury Department about banking and mortgage issues in 2005 and 2006. During those years, the mortgage industry pressed Congress to roll back strong state rules that sought to stem the rise of predatory tactics used by lenders and brokers to place homeowners in high-cost mortgages. For his work, Gramm and two other lobbyists collected $750,000 in fees from UBS’s American subsidiary. In the past year, UBS has written down more than $18 billion in exposure to subprime loans and other risky securities and is considering cutting as many as 8,000 jobs"
But certainly the Democrats have been almost as much at fault as the Republicans in this matter. Are we headed for a 1929 debacle? I hope not. I really do. But I am afraid that those who pushed hard to deregulate, to get government out of monitoring what banks did, who tried to separate banking and investment activity failed due to the greed of some who sought to maximize profits and stock prices at any cost. So much like they did in 1929. 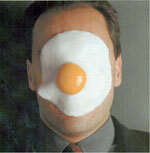 LDK Solar (LDK) and Servotronics (SVT) "Trading Transparency"
'Egg on my face' anyone? After spending the last 5+ years on this blog repeating endlessly the mantra of 'listening to my portfolio', what did I do? The darndest thing about this blog is that I have to do all of these dumb things so publicly! My portfolio was down to one position, my Covance (CVD) stock and I knew that I had these 'permission slips' to be buying shares. So with the first sign of a bit of strength in the market the last couple of days, I was in there full bore, moving back up to my minimum of 5 holdings. "Stocks plunged Thursday, sending the Dow Jones industrial average down 679 points -- more than 7 percent -- to its lowest level in five years. Stocks took a nosedive after a major credit-rating agency said it might cut its rating on General Motors and Ford, further rattling investors already fretting over the impact of tight credit on the economy." Specifically, the Dow closed at 8,579.19, down (678.19) or (7.33)% on the day, and the Nasdaq dipped to 1,645.12, down (95.21) or (5.47)%. And the S&P dropped to 909.92, down (75.02) or (7.62)%. And I was buying this morning. WHAT was I thinking? My own portfolio was talking to me. It was SHOUTING at me! And was I listening? 'course not. This morning LDK Solar (LDK) was acting well. It was even on the list ot top % gainers. I purchased 280 shares this morning at $23.7511. LDK went almost straight down from there. (Do I need to tell all of you once again that I am an amateur investor?) In fact LDK closed at $20.53, down $(.95) or (4.42)% on the day. Thus, I have already racked up a loss of $(3.22) or (13.6)% on the day. Unless the stock opens up sharply, I shall be selling this stock tomorrow morning shortly after the opening of trading. So much for owning a Chinese solar stock :(. Bit that wasn't enough. Totally a glutton for punishment today! In the same moments as buying shares of LDK, I became convinced of my brilliance in catching the turn of the market, and purchased 700 shares of Servotronics (SVT) at a price of $8.2785. SVT closed at $7.15, actually up $.15 or 2.14% on the day. But this was well under my own purchase price. In fact, I am currently at a loss of $(1.13) or (13.6)% since purchase. I have never (that I can remember) lost money so fast on initial purchases. Ouch. This position will also be sold tomorrow morning unless it experiences a sharp rebound-- as it has also exceeded my own arbitrary (8)% cut-off for losses. These really are both interesting stocks, I would love to tell you about their wonderful prospects, the great recent reports, but in this fiasco we call the Stock Market, I shall once again need to retreat with my tail between my legs. Servotronics (SVT) also has an interesting, if speculative financial record and prospects. My own probably sale is not that I do not like SVT. Or that I don't like LDK. Or any other stock I hold. Losing money is painful. And limiting losses is essential to any investor who is interested in being around tomorrow and the next day to try once again to divine some rational approach to the endless pain in the world of stocks. If you have any comments or questions, please feel free to email me at bobsadviceforstocks@lycos.com or leave them right on the blog. Potash (POT) and Graham (GHM) "Trading Transparency"
That nickel was really burning a hole in my pocket today! As you may know, I am currently down to 1 position. In my 'trading strategy' my portfolio is supposed to vary between 5 and 20 positions. It is quite a commentary that even with my efforts to replace positions, I am overwhelmed by this correction! To make a long story short, with the market apparently fighting back from a losing performance after the Fed cut rates by 1/2%, I thought it might be safe (?) to get back into the water. Potash (POT) and Graham (GHM). (I have to thank Doug S., a frequent commenter and reader here of this blog who pointed out that Graham might be worth another visit!) Both of these stocks have solid latest quarter results and Morningstar.com restated financials. And both have been under pressure lately selling far under their previous price levels. I purchased 70 shares of Potash at $95.84. Potash closed at $98.60, up $11.74 or 13.52% on the day. I also purchased 420 shares of Graham (GHM), an old favorite of mine, at $16.3258. GHM closed at $17.85, up $2.50 or 16.29% on the day. Both of these stocks were trading even higher prior to the close when the Dow managed to swoon once again (what a roller-coaster day it was in equities), to manage to close down at 9,258.10, down 189.01, and the Nasdaq closed at 1,740.33, down 14.55 on the day. Hopefully, I shall be able to hold onto these stocks for more than a few hours or days prior to having to once again yield to the terribly bearish forces acting upon our equity markets! Thanks again for stopping by and visiting. 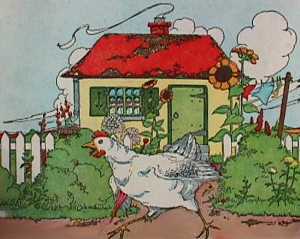 Global Payments (GPN) "Trading Transparency"
I was feeling a little like Chicken Little earlier today, feeling for sure that the 'sky was falling'! All of my stocks were hitting sale points and one by one I sold every single one of them except Covance (CVD). Perhaps that is the 'shake-out' everyone was looking for. I didn't panic. I just hit sale points! I am literally now down to one position. As I sold each of my holdings today, I did so in what I would call a disciplined fashion. I did not sell because of what I expected the market to do (if so the market reversed itself into the close to recover more than half of its dip), but rather simply based on the price performance. I am literally down to one holding in my portfolio, Covance (CVD) which is still well above its sale point. I now have four 'permission slips' to be adding new positions. I shall try to be relatively cautious (?) to avoid compounding my losses but shall look to pick up the highest quality stocks as I define them, that are performing well in a market that is also moving higher. This part is the arbitrary and judgement part of the whole formula. As long as a stock fills the criteria I utilize, and the market itself appears to be moving higher, I shall consider picking up shares. If I do so, I am sure to share with you my thoughts and the details of this purchase. Meanwhile, if you have any comments or questions, please feel free to leave them on the website or email me at bobsadviceforstocks@lycos.com. I cannot emphasize the above adequately. In these difficult market environments, it is imperative for all of you to sit down with your professional advisers and determine your own individual approach to the stock market. One of all-time favorite stocks is ResMed. I like to even point out that as a Peter Lynch type investment, I know their products. I use their products. And I like their financial results. But NO stock is immune to the market rampage going on today, this past week, and the past six months. As I write the market is trading at 9,649.17, down (676.21) points on the day. The Nasdaq is at 1,797.77, down (149.62) points. You can't make this stuff up! Trying to stay to my relatively rigid trading system in the midst of this chaos is a bit of a challenge. But I am doing it. In other words, ResMed has been flirting with an (8)% loss as I wrote earlier today. Unfortunately, the stock declined adequately to give me that loss and I sold my position. These past two sales have happened rather quickly. I am now down to only two positions (! ), my Global Payments (GPN) which is also approaching a sale point, and my Covance (CVD) which is well above a sale position for the time being. Thus, being under five positions, I actually have a 'buy signal' to add three new positions to my portfolio to get it back to the minimum of 5. I am not nuts however :). Thus, I shall be waiting for a little better environment before dipping my toes back into the water so to speak! I hope that all of you are holding up to the terrible stresses and financial performance of so many of the stocks out in the investment environment. As part of this blog, I have always kept all of you up to date with my stock purchases and sales. A few moments ago I sold my remaining 180 shares of Copart (CPRT) at $33.7488. My cost basis was approximately $33.72, so this was essentially a sale at 'break-even'. Copart (CPRT) has 'come back' somewhat since my sale a few moments ago (another case of my own bad timing), and is currently trading at $34.80, down $(2.84) or (7.55)% on the day. If the market tone should improve, as long as there is no adverse news from this company, I would in my own amateur way be upgrading this stock. One has to wonder if there are any stocks truly worth rating 'hold' today! As I write, the Dow is at 9,802.01, down (523.36) on the day, and the Nasdaq is at 1,829.34, down (118.05). This sale today was not based on any particular belief of mine about the company, the stock, or the stock market tone or decline. Instead, the sale was triggered by my own trading rules governing sales of holdings. After an initial purchase of stock within my portfolio, I set a limit of (8)% prior to selling my holding completely. I also sell portions of shares as they appreciate--currently selling 1/7th of my holding if the stock should appreciate 30, 60, 90, 120, 180, 240%, etc., at each of those levels. The tricky part comes in about selling a holding after an partial sale or two of a stock. This is what happened with Copart (CPRT). After my initial purchase of Copart back a year ago on 9/27/07, at approximately $33.72 (the 210 shares were purchased in two lots pennies apart in cost), the stock went ahead and appreciated enough to trigger my first sale at a 30% gain on 5/29/08. Since I had a sale at a gain, my tolerance for a loss was raised with my sale point moved to 'break-even' instead of an (8)% loss level. And that was exactly what happened this morning. So I am now down to 3 positions, 2 under my minimum of 5. Thus, I technically have a 'buy signal', actually two 'buy signals' but instead of buying anything, I am sitting tight, licking my wounds, and watching as my ResMed stock (RMD) approaches that (8)% loss level for me and gets unloaded. Where does this lead? I don't really know. I do know that my own crazy system is doing what it is supposed to do. It is leading me out of equities into cash, perhaps keeping my capital a little bit intact as the great bear of this correction ravages the account values of little investors like me across this nation. If you have any comments or questions, please feel free to leave them on the website or email me at bobsadviceforstocks@lycos.com. 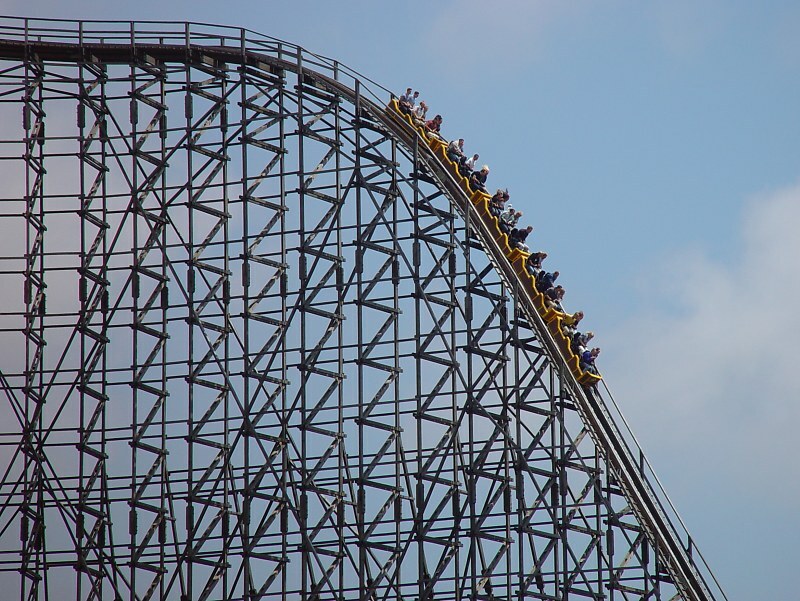 Estee Lauder (EL) "Trading Transparency"
I thought a picture of a rollercoaster, this one of the Colossos from Germany, might best describe my own feelings of the market as euphoria alternates with depression in what I would have to describe as one major financial 'bi-polar' disorder. This morning with stocks climbing in anticipation of the House approval of the $700 billion bail-out (?rescue), I picked up my 5th new position, Global Payments (GPN) which I wrote about here on this blog in an earlier post. Moments later I realized that my Estee Lauder (EL) was now hitting a sale point with an (8)% loss after my initial purchase. I went ahead and sold my 140 shares of Estee Lauder (EL) at a price of $45.532. These shares had been purchased just weeks ago on 8/14/08 at a cost basis of $49.93/share. Thus, I had a loss of $(4.40) or (8.8)% since my purchase triggering (manually) my sale of the shares. EL actually rebounded slightly after my sale, closing today at $46.13, down $(2.12) or (4.39)% on the day. Now, once again under my 5 position minimum, I literally have a 'permission slip' to be adding a new position to my portfolio. Generally after a sale on bad news I would be 'sitting on my hands' but in this case, I shall be looking for a new stock to purchase. I shall do this Monday, pending an improvement of the overall market tone. Meanwhile, I shall sit back, lick my wounds, and be simply amazed at the incredible volatility in stock prices we are witnessing. By the way, if you are ever in La Crosse, stop by Grounded and you might catch me discussing a stock or too with Todd the proprietor! Yesterday I wrote about my sale of Greif (GEF) on an 8% loss. As I reminded my readers, my portfolio management strategy demands that I unload shares that hit pre-specified losses. After an initial purchase, stocks that dip 8% are sold. This limits my losses and enables me to preserve my gains. Also, I commented once again about the other part of my portfolio management strategy, that while not actually trying to 'time' the market, is designed to respond to market influences by shifting either into or out of cash and equities depending on the performance of my own holdings in my portfolio. On the other hand, I also use sales of stocks on 'bad news' (either fundamental news that is negative or a sale on a decline in the price of a stock as I did with Greif when it reached an (8)% loss) as a signal that something is 'wrong' with the market and that leaving the proceeds of that sale in cash would be the correct approach. I utilize this strategy as long as my holdings are above 5 positions. At the minimum level (which I was at yesterday), a sale of a position would result in only 4 positions and in this particular situation a 'buy' signal is generated to get me back to 5 holdings. Yesterday no stocks came up on my 'radar' and I sat on my hands with the proceeds. Today, however, with the atmosphere a little more optimistic that a 'bail-out' or 'rescue' of the financial companies might well pass the House of Representatives (? ), stocks are moving higher with the Dow, as I write, is trading at 10,673 up 190, and the S&P is at 1,140.95, up 26. Starting my usual search routing, I checked the list of top % gainers and came across Global Payments (GPN), an old favorite of mine (trading at $47.87, up $6.81 or 16.59% as I write), and with 'permission slip' in hand, went ahead and purchased 140 shares at $48.2395 in my account. (You can see that the stock has already dipped about $.40/share since my purchase). Let me share with you briefly a few of the things that led me to this decision today. "...provides payment processing and consumer money transfer services worldwide. The company�s Merchant Services segment provides credit and debit card transaction processing services, including processing Visa, MasterCard, Discover credit cards, and cards issued by other card associations; and check-related services comprising check verification, guarantee, and recovery services. This segment also offers proprietary software products to establish revolving check cashing limits for the casinos customers in the gaming industry. In addition, it sells, installs, and services automated teller machine and point of sale terminals; and provides authorization, electronic draft capture, and file transfer services, as well as offers merchant accounting and various back office services." What about the latest quarterly result? As is often the case (when the market appears to be functioning somewhat normally), it was the announcement of earnings yesterday after the close of trading that resulted in the sharp rise in the stock price today. On October 2, 2008, Global Payment announced first quarter 2009 results. For the quarter ended August 31, 2008, sales climbed 30% to $405.8 million, up from $311 million last year. Earnings came in at $57.5 million or $.71/share, up from $43.6 million or $.54/share last year. Furthermore, to add some icing on this great cake of results, (now that is an awful image don't you think? ), the company raised guidance for fiscal 2009 to revenue of $1.64-$1.68 billion, compared to the $1.27 billion in revenue in fiscal 2008. Earnings estimates were also raised to a range of $2.37 to $2.45 from the $1.98 in 2008. I cannot over-emphasize the importance of doing better than what everyone was expecting and to top off the announcement, to raise future expectations and estimates as well! Needless to say, in the context of a market already rebounding today, this gave this stock the extra momentum to make a very nice move---and move higher it did! If we review the Morningstar.com "5-Yr Restated" financials, you can see why this has been a stock that has been a 'favorite' of mine for literally years! Let me explain. First of all, revenue has steadily improved from $629 million in 2004 to $1.27 billion in the trailing twelve months (TTM). Earnings have also not 'missed a beat' increasing from $.80/share in 2004 to $2.01 in 2008. The company has been paying a dividend of $.08/share, but unfortunately, has not been in the habit of raising it. Total shares have been very stable with 75 million in 2004, increasing to only 78 million in 2008. Free cash flow has been positive and relatively stable at $210 million in 2006 and $227 million in 2008. The balance sheet is solid with $456 million in cash and $161 million in other current assets, easily covering the $217.8 million in current liabilities yielding a current ratio of almost 3.0. The company has a nominal amount of long-term debt reported at $101.3 million. What this means is that this company could easily 'write a check' with available cash and pay off ALL short-term and long-term liabilities almost 2x over! We don't get to see this kind of balance sheet too often! According to the Yahoo "Key Statistics" on GPN, the company has a market cap of $3.86 billion, making it a mid cap stock. The trailing p/e isn't bad at 24.12 (from my perspective), with a forward p/e (fye 31-May-10) of only 18.51. With the rapid growth in earnings estimated (and estimates are still moving higher--see above), the PEG works out to a very acceptable 1.22 level. As I noted earlier, there are 79.66 million shares outstanding and currently (as of 9/10/08) there are 3.61 million shares out short, yielding a short ratio of 5.2 trading days (above my own '3 day rule'). Thus, this is significant imho. Also as noted, the company pays a small dividend of $.08/share yielding 0.2%. The last stock split was a 2:1 split back on October 31, 2005. 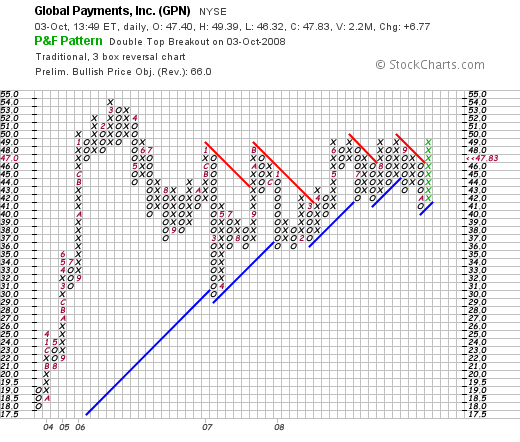 If we look at a 'point & figure' on Global Payments (GPN) from StockCharts.com, we can see that the stock, which moved sharply higher from $18 in September, 2003, to a peak of $54 in March, 2006, dipped down to a low of $29 in March, 2007, and has been 'working hard' to build a slowly increasing base. The company just broke through resistance in its current move higher. It doesn't appear to be over-extended and appears to have some suppport at current levels. Well obviously, I liked this stock enough to buy some shares :). But seriously, if it weren't for the terrible volatility in the current market, the uncertainty regarding the success of the 'bailout' and the difficult credit crisis, this stock ought to be flying higher. The reported a great quarter last night which beat expectations, they raised guidance, and they have a record of steady financial results for the past five years (or more!). Their fundamentals also appear solid with plenty of free cash flow and a great balance sheet. Their chart appears to be solid, and hopefully ready to move higher. Wish me luck! Of course, like any investment, I shall sell even shares of this great company should they decline (8)%! And I shall start selling on the upside (1/7th of my holding) should the stock instead appreciate and move higher! Thanks again for visiting! If you have any comments or questions, please feel free to leave them on the blog or email me at bobsadviceforstocks@lycos.com. If you get a chance, be sure and visit my Covestor Page, my SocialPicks page, and my Podcast Page.